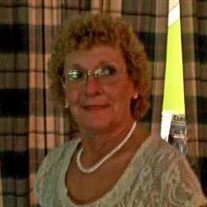 Obituary for Elizabeth Faye (Stephens) Miller | Butler Funeral Home, Inc.
Elizabeth Faye Miller, 59, of Anderson, Indiana passed away on February 2, 2019. She was born July 9, 1959 in Glasgow and resided most of her life in Indiana. Elizabeth Faye graduated from Metcalfe County High School in 1977. She was a driver for Carter Express Inc. Her passion in life was spending time with her family, especially her grandchildren. Elizabeth Faye is survived by her loving husband of 12 years, Theo Wayne Miller, Sr.; children, Corey Stephens of Edmonton, Robert (Heather) Bowman of Edmonton and Quila Thompson of Anderson, Indiana. Grandchildren; Joselyn Eldridge, Destiny and Hodge Stephens and Wesley and Donna Bowman. Also surviving are her siblings, Lynn (Mary) Stephens of Glasgow, Mark Stephens of Edmonton, Cheri Stephens and Melanie Amburgey of Edmonton. A nephew Peyton Stephens and numerous cousins. She was preceded in death by her mother Lizzie Mae Stephens and her sister Lori Bragg. Funeral services will take place 1:00 PM Saturday, February 9, 2019 at Butler Funeral Home in Edmonton with burial in the Smith Cemetery at Knob Lick. Visitation will be from 4:00 PM until 8:00 PM Tuesday at Loose Funeral Homes & Crematory in Anderson, Indiana. Also from 11:00 AM until service time Saturday at Butler Funeral Home. Memorial contributions may be made to ASPCA.